Ancient house tourangelle of charm, entirely renovated, framework arbor and closed. The house Perrotin welcomes you ... and invites you to spend a stay combining lifestyle, culture and dynamism. This old house tourangelle of the nineteenth century, completely renovated welcomes you in a bucolic and wooded and closed 2000 m2. Ideally located in the heart of the Loire Valley castles, in the Anjou-Touraine National Park, in a short time you can reach the many major historical sites of the Loire Valley. The surrounding countryside will invite you to escape in the forest, stroll along the water, discovering here and there a vineyard of a wash house ... the fishermen will not be left behind, they Will be able to quietly tease the stud, the roach, the minnows ... in the manse, the vienne or the loire. The children will appreciate the proximity of the futuroscope, the zoo of doué-la-fontaine and the aquarium of touraine ... depending on the season, the gourmands will be able to enjoy in full freedom the fruits of the orchard. The bathroom is upstairs. It includes a tub shower, sink and toilet. In this equipment adds a large closet, coat hooks, hair dryer, heated towel rail. Of separate toilets with wash basin are on the ground floor. The attic rooms also has a sink and toilet. This property is even more stunning than in the photos. We absolutely loved staying here; like living in a piece of history. Very tastefully decorated and absolutely spotless. The owner was extremely welcoming - thank you for the lovely homemade jam and bottle of local wine on arrival. The house was the perfect base for exploring the Loire valley. So much to see and do, we couldn't fit it all in. The surrounding countryside and thousands of sunflowers made for lovely drives between the different chateaux ,towns and villages. Would love to come back again! Thank you Florent and Juanella from the Crew family. A charming character cottage set in a lovely garden with good parking. We loved everything about this well equipped house. The owners gave us wine and delicious home made jam on arrival and were very helpful. There is an excellent restaurant in walking distance. We would stay again. Beautifully furnished historic house with extensive gardens. Maison Perrotin was even lovelier than the website photos - sympathetically restored and furnished with beautiful antiques (as well as all of the essentials). It is very spacious and cool inside (even on hot days) due to the thick walls and small windows. We spent most of our holiday outside however in the huge garden, trying out the different seating areas and barbecuing. Plenty of choice of sun or shade and none of it overlooked. Dined at the local auberge twice (two minutes walk) We also very much enjoyed walking and cycling in the surrounding countryside which was a charming mixture of vineyards and sunflowers. Easy drive (or cycle) to many nearby chateaux - particularly recommend L'Islette and Langeais. Thank you for a delightful stay - we would love to return one day. After arriving very late due an evening flight from UK, we were welcomed at around midnight by the owner Florent and his son. He was very kind, spoke good English and showed us around the stunning property before leaving us to settle to bed. Despite the lateness of our arrival he waited for us and welcomed us with a big smile! The cottage which has plenty of private enclosed parking, is within metres and easy walking distance of some amazing rural countryside and beautiful landscapes. There were bikes to use which we found fun (2 adult, 2 teenager and small child ) and a large supermarket only a 5min drive away which sells everything you could ever need at very reasonable prices. It was our sons 16th birthday so we decided to visit Paris on one of our days . We travelled from Gare de Tours and bought day trip rail tickets which were about 40€ each return . This got us to Paris where we bought Metro (underground) tickets to hop on and off at the major tourist sites! Well worth it and so much fun. Countless numbers of chateaux and vineyards within easy reach from the cottage . We visited Château du Petit Thouars for a vineyard tour and wine tasting. It was a small family run vineyard with amazing history (from €5 each) . We also travelled to La Rochelle which was a 2h car ride . In hindsight my husband said it was probably a bit adventurous, but was a beautiful seaside city! The cottage was well equipped , decorated authentically and was spotlessly clean. There was a gift of jams and marmalade on the table made by Florent's wife Juanella which was a lovely touch and delicious! The grounds are stunning with fruit trees and lots of different garden areas to sit in and enjoy a glass of wine in the evening. Amazingly peaceful and tranquil. The children enjoyed a vast array of games on offer including swing ball, tennis, table tennis and swings. The garden is also superb for hide and seek as the sun is setting ! If you are reading this wondering wether to book this stunning place then all I can say is do it! You will not be disappointed I promise. One of he best holidays ever. Our family was taken aback by the beauty of this property. 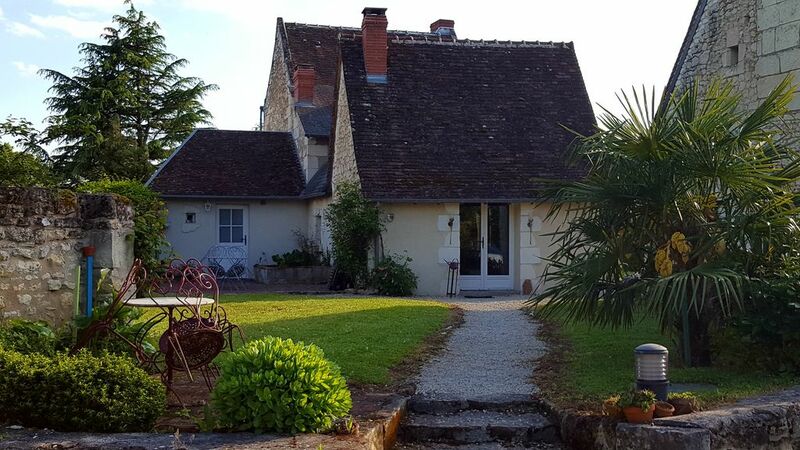 The drive through the sunflowers, lavender, and wheat fields of the French countryside was breathtaking, and a perfect preview to our first impression of this house and garden. Every inch is lovely and every detail is perfect. The buildings are ancient with beams in the ceilings, stone walls, and wood floors. The gardens are gorgeous with fruit trees, hydrangeas, wisteria, and quant curved metal chairs and tables artfully tucked into shady corners. The entire effect was so beautiful that we drove 20 miles to find an art supply store and spent a whole day painting it. The house had plenty of room for our family of five, the kitchen was well equipped - although we found the dishwasher tricky - the bbq and clothes washer worked well, and everything was clean. My only suggestion would be to add a clothes dryer. The Loire Valley is exquisite. We visited four different castles - each magnificent in their own way - and enjoyed the local wines and food. We would love to come back and if we do, we absolutely will stay in this special place.